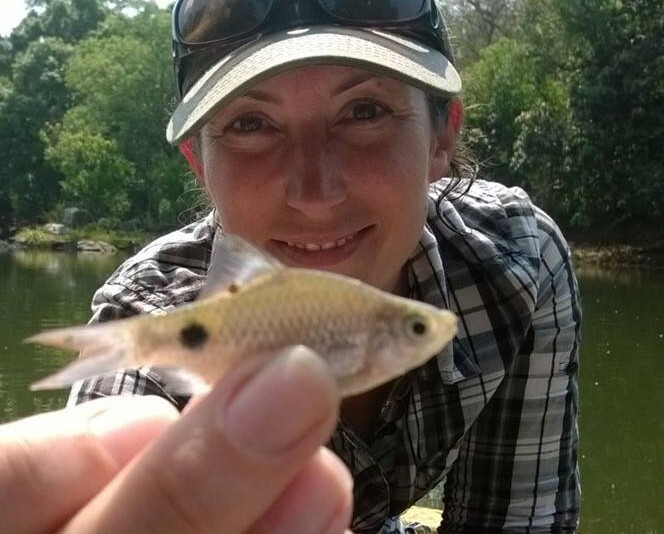 Shannon Bower is a PhD candidate in the Fish Ecology and Conservation Physiology Laboratory at Carleton University in Ottawa, Canada and one of the co-ordinators of the TBTI Inland Fisheries Cluster. Shannon strongly believes that recreational fisheries can be a powerful force for maintaining resilient fish populations that support healthy communities and sustainable livelihoods, and that responsibly managed recreational fisheries can act to bridge gaps and mobilize collaborations among SSF sectors. Around the world, recreational fisheries are growing rapidly, particularly in countries with developing and transitioning economies. Despite this growth, little information is available surrounding key fishery attributes in these areas, including catch and participation rates, life history traits of target species, and economic expenditures derived from the activity (and movement of these monies through communities). Shannon’s research works to address these data deficiencies by developing an integrated (biological, social, economic) framework for rapid recreational fishery assessments. The blue-finned mahseer (Tor khudree) catch-and-release fishery of the Cauvery River, India forms the backbone of this research. She firmly supports co-operative research and community engagement and so incorporates these relationships into all aspects of her work, including highlighting SSF and fish conservation through social media channels. You can follow her on Twitter @shannonbfishin, and on Facebook or Instagram at Rec_Fish_Reels. SB: In addition to my PhD research, I’m also working on a few SSF projects in the recreational fishing context that focus on knowledge mobilization among anglers. Through the IUCN Species Survival Commission, I’m working with a large group of researchers and specialists to develop a series of guidelines for the recreational fishing of threatened species that offers anglers, outfitters, policy makers, and managers strategies for voluntary adoption of best practices to promote survivorship of threatened species after catch and release. I’m also working with my research partners in India in preparation for World Fish Migration Day 2016, planning for a series of angling camps to discuss local fisheries issues, fisheries sustainability and opportunities for establishing positive community relationships. SB: I’ve found it really heartening to see the increasing recognition of the need for a stronger role for community-level empowerment and representation in management decisions and relationships. I’d like to see increased operationalization of this recognition in governance systems (e.g., to see consultation processes and two-way communication pathways become an integral part of policy and management processes). We’ve seen some really positive successes through various forms of co-operative management and I think we can go even further with getting more voices to the table. A second key factor to securing sustainability will be establishing mechanisms for adaptability in governance systems: static solutions can be rendered maladaptive over time, and the challenges SSF are facing need long-term, flexible, and evidence-based solutions.